Monster Hunter World might be the hot new title for Capcom right now, but it’s teaming up with Street Fighter 5, another Capcom game, for the Street Fighter 5 Collaboration event. In this Monster Hunter World Street Fighter 5 gear guide, we’ll be walking you through how to get your hands on both Ryu and Sakura’s gear, so you can look just like the iconic Street Fighter characters while taking down gigantic beasts. If you instead need anything else on Monster Hunter World, including how to track down a monster using the Scout Flies, as well as how to slay any monster in the game, from an Anjanath to a Rathalos, head over to our Monster Hunter World guides walkthrough hub. 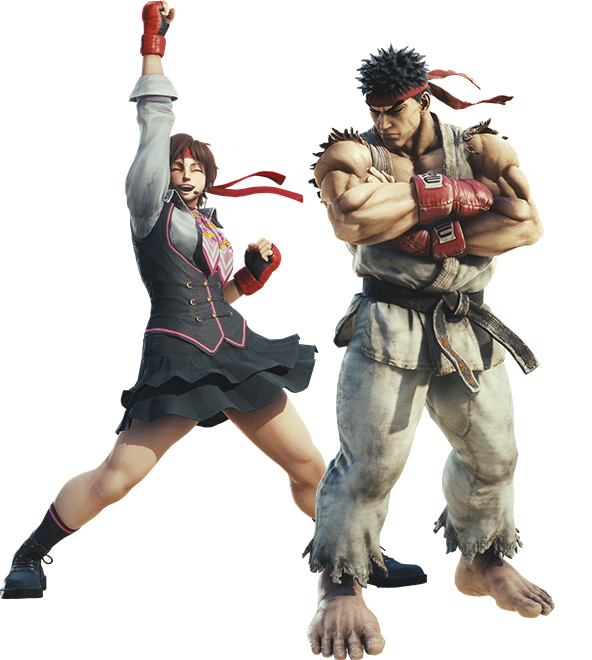 Two of the more famed Street Fighter characters over the generations are Ryu and Sakura, the former of which has regularly appeared on just about every Street Fighter cover over the years. You can look exactly like the two characters pictured just below in Monster Hunter World, but only once you’ve unlocked both outfits for crafting at the Smithy. Sakura’s outfit isn’t actually available right now in Monster Hunter World, but you can get your hands on Ryu's gear within Monster Hunter World, through the Street Fighter 5 Collaboration Event. This event, called the ‘Collaboration Event: Street Fighter 5: Round 1’, kicked off in Monster Hunter World on February 16, and although it originally ran until March 1, it's back right now as part of the Monster Hunter World Spring Blossom Festival event, so you've got another shot at undertaking it. To gain access to the limited event, you’ll have to own a copy of Street Fighter 5 or Street Fighter 5: Arcade Edition on your PS4. If you have save data for either of these games registered on your PS4, then on February 16 you’ll be able to undertake the ‘Down the Dark, Muddy Path’ quest, which you’ll be able to find under the ‘Events’ section on the Quest Board. 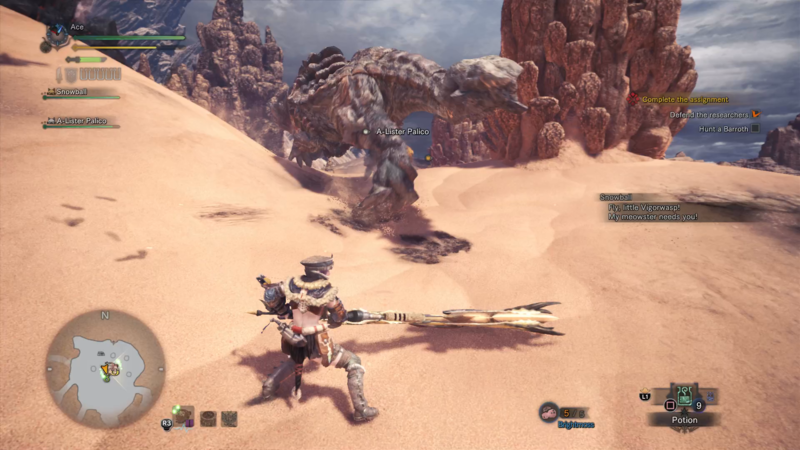 This Down the Dark, Muddy Path quest takes place in the Arena, and you’ll find yourself going up against the intimidating Barroth. Head over to our full Barroth guide if you need help with killing the monster that usually dwells in the Wildspire Waste, but as long as you take on a fairly powerful weapon or some friends, you shouldn’t have too much trouble seeing off the beast. Once you've successfully slain the Barroth on the Arena, head over to the Smithy within the Workshop, and you'll be able to craft Ryu's outfit using the items rewarded to you from the Down the Dark, Muddy Path quest. Just like the Aloy outfit, this gear will change the appearance of your character to look exactly like Ryu from Street Fighter 5. But while you need Street Fighter V save data on your PS4 to undertake the Down the Dark, Muddy Path quest, you don't need the save data to get your hands on the multiple new gestures available. 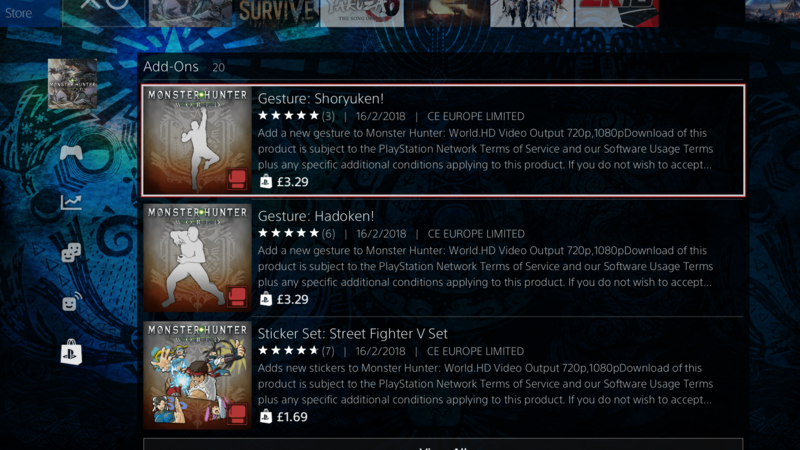 The new gestures for your character include the Shoryuken and Hadoken gestures, as well as a brand new Sticker Set as a separate purchase. You will have to purchase these new gestures and Sticker Set as DLC however, as you can see just below. This is everything you need to complete the Collaboration Event: Street Fighter 5, Round 1 quest now that it's finally begun, but make sure to keep an eye on this guide, as we’ll be updating it when Sakura’s gear is available for you to obtain in Monster Hunter World. Now that we’re all done with this guide on Ryu’s outfit, feel free to head over to our additional Monster Hunter World guides, including how to get the Plunderblade, as well as how to slay a Legiana.